Affluent homebuyers are doing their energy efficiency homework, not so they can “go green”, but so they are never a slave to an out of control power bill as a result of some future period of inflation. Affluent homeowners that are building new homes see the size of their current residence as too large and inefficient. They see taxes and their large power bills as not-so-distant threats to their lifestyle when they are retired and are no longer capable of maintaining their current income. They know that controlling taxes is the function of a collective vote, but using energy efficiency products is their opportunity to control the power bill. Today, residential architects and builders are offering insulation and infiltration packages that air seal homes like a plastic bag and thermally seal these homes like an igloo cooler. We are seeing windows that have an R factor of 11, and that’s not COG (center of glass), that’s the aggregate installed window enclosure. We know this kind of infiltration control is not realistic for all homes, but even with infiltration control at 3 air changes per hour at 50 pascals (during a blower door test), we are seeing cooling and heating cost down to 3 cents per month per square foot on a yearly average. Just to save you the trouble…on a 2500 square foot home, that’s a power bill averaging around $75 per month (using 10 cents per kWh). Affluent homeowners want this piece of mind, AND THEY WANT COMFORT. If you ask them about the comfort system in their old house, they will tell you about the hot spots in summer and cold spots in winter. Also, noisy, dirty, smelly, stagnant and unhealthy are all the adjectives that describe the air that new buyers are determined to eliminate in their new home. These folks have already dealt with the rest and they are truly looking for the best. 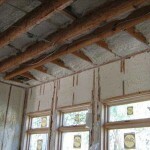 The outstanding and very expensive insulation and infiltration packages are proof of that. Price is secondary to a business relationship of trust. Plain talk and well explained options on a written proposal are the building blocks for this relationship of trust. Be ready to guarantee your load calculations, the temperature control in specific areas, and even the power usage. These folks are willing to pay for it if you can convince them that your company can provide all the specifics they are looking for. For example, show the temperatures that the homeowner specifies in each zone, master bedroom might require a “chilly sleeping temperature of 68⁰F”. Room by room thermostat control – zoning allows many points of control so that temperatures can be closely controlled when necessary and energy efficient when close control is not important. Two-speed systems – high and low speeds work in conjunction with zoning to use only the power necessary to control the zones that are operating. Quiet equipment operation – especially bedrooms, home office, theater, piano room, etc. Correct bypass operation when using zoning is essential. Use only the modulating bypass system. 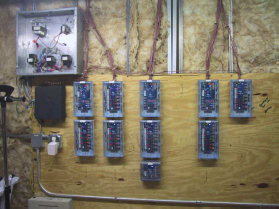 Economizer control – cools using outdoor air similar to the “whole house fan”. In mild weather the system mixes “suitable” outdoor air with return air to provide cool supply air without energizing the condensing unit. Dehumidification Control – controls high humidity especially during periods of low air conditioning system runtime. Uses a separate de-humidistat to control the dehumidifier. Humidification Control – in cold weather, water vapor needs to be introduced so that furniture, paintings, artwork and even humans and animals don’t deal with the damaging and uncomfortable effects low air moisture content. Radiant floor heating – is absolutely the most comfortable space heating system in existence today. 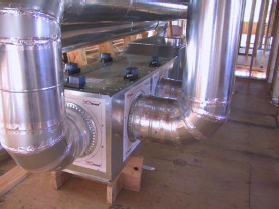 Also, gas fired hydronic radiant floors are actually 40% more efficient than forced air heating. 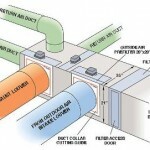 Electronic air cleaners – actually used to clean the air without restricting airflow. A filter, by definition, will ultimately restrict airflow as it “filters” and becomes blocked and very inefficient. Ultra-violet air purification – the disinfecting quality of UV light purification is well known in hospitals and barber shops. We now can use this technology to clean, disinfect and purify circulating air. Computer-controlled thermostats – using a single computer or any computer throughout the world, monitor and control the temperature and power usage in your building. High pressure misting systems outside – used on outdoor patios and other outdoor lounging areas, a minute′ amount of water is atomized under high pressure for an evaporative cooling effect. 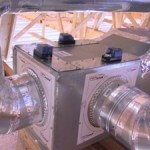 Solar thermal water heating – for domestic water heating as well as radiant floor water heating. 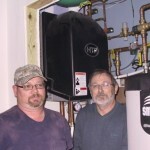 Free space and water heating with a 30% tax credit available on the total cost of both. 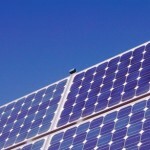 Solar photovoltaics – Allows homeowners to sever their connection to the power company. Free power from the sun can charge batteries so power is available for use anytime. HVAC Contractors can use these items above as options to enhance their offering and separate their company from the average. Affluent buyers may be interested in only one or two, but they would like to hear your comments on why each of these items is important now and will be even more important in the future. 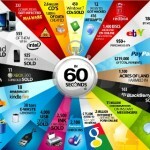 This builds repore and that business relationship of trust that will get you the project as price becomes secondary. At Comfort Products, Inc. we offer all of these items to our contractors. Most important, we offer the sales and technical expertise and training support to help you install these items profitably. 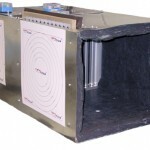 ComfortPLENUM is a plenum with zone dampers built in. Saves labor, installation space and delivers a good looking project. SmartZone controls are easy and reliable. Service is very intuitive with supply air temperature display and L.E.D.’s for every thermostat, damper and equipment call. 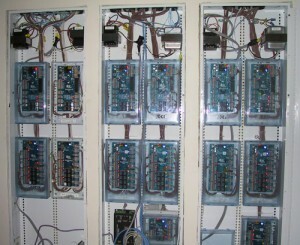 Computer-controlled thermostats allow the building owner to control lots of thermostats from one location. 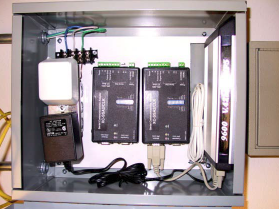 Monitor, change temperatures, set schedules and monitor runtime data are all great features. For more information, view our products or contact us!